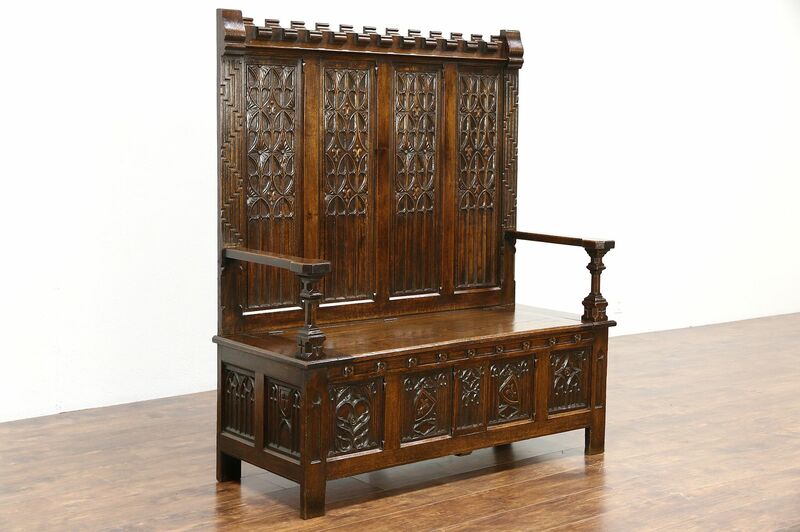 Wonderfully hand carved in the Gothic manner, this solid oak hall bench was crafted in Holland about 1890. The original finish is very well preserved, and has been waxed and buffed, so all that is needed to maintain the warm patina is an occasional wipe with a soft dry cloth. There are shrinkage separations from age, especially on the seat, see photos. This Dutch antique furniture has generous storage under the seat. Measurements are 53 1/2" wide, 21" deep, 60" tall and the seat is 19" high.